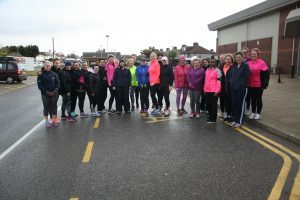 Active Sefton has announced that its hugely successful Couch to 5k programme will be heading to Southport next week. Taking place every Tuesday and Thursday, from 6-7pm, at Hesketh Park, the classes will run for 10 weeks from May 1. On street parking is available and classes will meet at the greenhouse near the lake. The free sessions are perfect training for those looking to prepare for a summer running event and will help attendees slowly build up to running 5K at their own pace. Classes are drop in, drop out but it is recommended that runners take part in as many as possible. At the end of the programme all runners will be invited to take part in the Southport Park Run on Saturday, July 7. Running has many health benefits, including improved heart and lungs; and when combined with a healthy diet can result in weight loss. A more active life style is also known to improve mental health and can act as a great stress reliever. Sefton’s young girls are invited to show off their football skills at Dunes Splash World’s new 3G sports pitches from Tuesday, April 24. 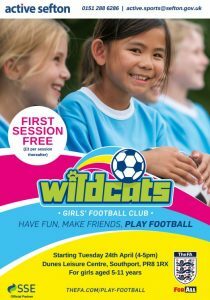 SSE Wildcats Girls’ Football Centres from The FA will provide Sefton’s girls aged 5-11 with regular opportunities to play football as well as promoting opportunities to progress to local clubs within the Southport area. Created exclusively for girls, the weekly sessions will take place every Tuesday from 4-5pm and will provide a fun and engaging environment for girls who are keen to try their hand at a game of football. Active Sefton hopes the initiative will inspire participants to engage with football, meet new friends, develop fundamental skills, learn new things and create the foundation for a lifelong love of football. In addition, Active Sefton will be developing further opportunities to be involved in football, including walking football and soccercise sessions in the coming months. Tina Pilkington, Health and Wellbeing Development Manager at Sefton Council, said: “Women’s football has truly gained momentum in recent years and this makes it all the more important for local authorities to ensure that doors are open for young girls to have access to the sport. Kelly Simmons, FA Participation and Development Director, said: “Since the launch of SSE Wildcats we have seen great enthusiasm from the girls taking part to continue learning and playing football. The first session in free and sessions thereafter will cost £3 each. For more information about the Wildcats visit THEFA.com/play-football. Netherton Activity Centre’s fitness suite will be temporarily closed next week while it undergoes a significant refurbishment. The suite will be closed between Friday April 13 and Friday April 20 while contractors complete the required works. During the renovation, the fitness studio timetable will be in operation and will not be affected by the Fitness Suite closure. 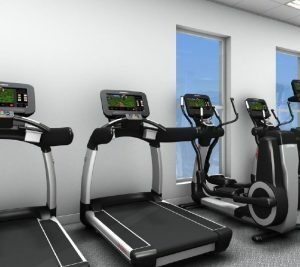 Chris Porrino, Sefton Council’s Senior Health & Fitness Development Manager, said: “We are extremely excited to be bringing the latest in exercise innovation to our already excellent service offering. Netherton will have the very best training kit available, including strength & conditioning rack, cable cross over, functional training rig, battle ropes and Plyo boxes to name just a few! “The new Cardio and Strength kit is the best there is and has the latest in multimedia connections with everything from TV to app integration through your smartphone. “Improvements to our group exercise studio will also be made with replacement spin bikes and the installation of Les Mills Virtual class instruction being made available to our users! Netherton Activity Centre’s fitness suite is set to reopen on Saturday April 21. The way that NHS Health Checks are available in Sefton is changing from April. Your free NHS Health Check will now be done by staff from Active Lifestyles and Living Well Sefton. If you’re aged 40 to 74 you may be eligible for a free NHS Health Check, which is a great way to get personalised advice on keeping yourself healthy and active. It checks that some of your body’s most important systems are all running smoothly and it helps to spot any potential problems before they cause real damage. Your blood pressure, cholesterol and BMI will all be checked. There are some things that you can’t change – like your age, ethnicity or family history, but the most important factors on your future health – such as your weight, cholesterol level and blood pressure – can be changed. After your NHS Health Check you’ll be given advice and support to helps you improve your health; including free and easier access to local activities you might want to take up to keep yourself happy, healthy and active. To book your free NHS Health Check ring 0151 934 2352 or you can access any of the sessions available locally in various venues throughout Sefton.